Anorexia in teenage girls is a growing issue these days. Inside one out of every hundred young women there is a war being fought; the war of anorexia, where its victims are dying to be thin. 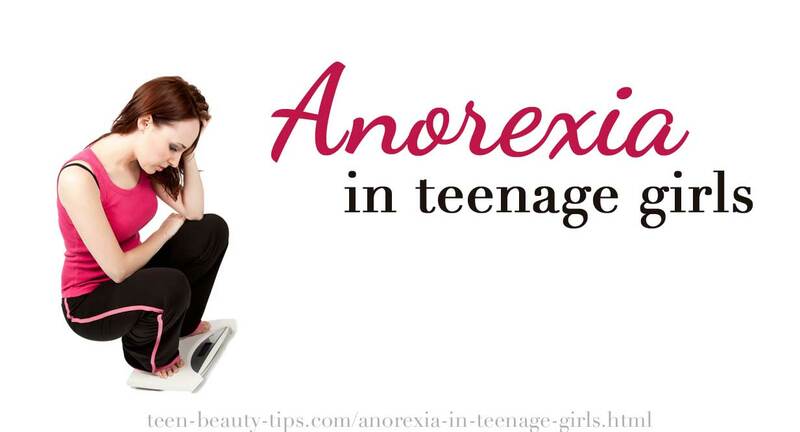 Anorexia in teenage girls is a dangerous eating disorder that involves self-starvation. It is both a mental and physical condition and despite popular belief is not about food. It involves extreme emotions, behaviors and attitudes surrounding weight. A person who is suffering from anorexia fears being fat and is in a constant pursuit of being thin. They also fear losing control and this is the way that has formed for them to cope with their issues. Girls with anorexia are usually living with low self-esteem and perfection issues. They feel the need to control their emotions and their surroundings. All of their self-esteem begins to hinge on how they look and what they weigh. In our society being extremely thin is a standard of beauty. Sometimes being thin is considered a standard of happiness, success, and even control. I was watching a show on TV not too long ago where a man was accusing people who were not thin, of being weak and having no self-control. What message was being sent out to the millions of other people who viewed this? Now take a look at this quote from super model, Trya Banks when she did an interview with People magazine - "I get so much mail from young girls who say, “I look up to you, you're not as skinny as everyone else, I think you're beautiful," she told People. "So when they say that my body is 'ugly' and 'disgusting,' what does that make those girls feel like?" The media influence on anorexia also goes deeper. The media tells us we’re not thin enough, not happy enough and not in control enough. But the images being sent to us are unrealistic, unhealthy and most of the time unattainable...and don’t forget most of the images in print have been airbrushed to hide flaws. Every day we are exposed to about 400-600 images, sometimes more. One out of every eleven of these ads will be for a beauty product. And the models that we are seeing in these advertisements are 25% less than their ideal weight. This also happens to be an increase from 10 years ago when the average model weighed 8% less than her ideal weight. The media constantly sends us messages that we are just not thin enough, that we’re not happy because we weigh too much. They take it as far as they can too by criticizing on models and actresses when they gain even a little bit of weight making it out to be a big deal. While the media definitely plays a role on how we view ourselves, anorexia in teenage girls has other causes as well. Anorexia is a way of coping with what’s going on in a teen’s life. Stress, pain, anger, acceptance, confusion and fear can all trigger this eating disorder as part of the anorexia causes. The goal they are trying to reach is one of trying to make their whole life better. Another trigger for girls with anorexia is family environment. Families can play a huge role on each other. Some families are over protective and smothering which can create a need or rather a demand for independence. Some families are criticizing of weight or in other areas, or are rigid and even abusive. Some younger people do not feel safe in their own homes, they don’t know where to turn or what to do and the need to find a way to deal with what’s going on in their lives. Life transitions such as a break up, a divorce, death of a loved one, failure at school or at work are all stressful incidents that need to be dealt with. Genetic factors can also play its part in contributing - anorexia in teenage girls occurs eight times more often in people who have relatives with the disorder. Learn the signs and symptoms of Anorexia here. Treatment4Addition.com offers more information and help for eating disorders. If you are dealing with Anorexia, or you are watching a friend go through this battle, we want you to know that you are not alone. We would love to pray for you and support you. So send us your prayer requests here. You can also find tips for winning the Anorexia battle here and share your story below. Have you or a friend of yours struggled with an eating disorder? If so, tell us your story and get encouragement from those who care. Click below to read others stories of how God is at work in their lives. I'm ashamed to say this but I kinda want to be anorexic.. Constant battle, with food, and it’s the media's fault! i have never liked myself. Dont know what to do anymore.. I don't have a problem do I??? Can I do anything for my friend? Help me. I NEED HELP ESCAPING FROM THIS MONSTER. My friend is anorexic..what should I do? Anorexia is taking over my life. Anorexia? me? How did this happen..? On the verge of eating nothing at all. I wish I was skinny..
Be perfect or die trying. I had no idea... What a reality check for me! MY LIFE FOR 6 MONTHS; WE FINALLY CAUGHT IT!!!! I'm over it and I don't care about what people say. Physically it might go, but mentally it will stay with you forever. When I said I didnt want to be like the stars in magazines, I finally wasnt lying to myself. Ever since my dad told me about this...i have been trying to get over 80 pounds. But i just can't and im afraid.